Highlands NC fly fishing guide serving the Highlands area since 1987! The most popular waters will be listed in the submenus below the header at the top of the page. Mac Brown Fly Fish offers something for all skill levels. I teach trout fishing lessons, guided fly fishing wade and float trips, fly fishing schools and fly casting for over three decades. Learn from a Master Instructor to improve your fly fishing experiences! Use the menu at top of the page for info on our specialties. Highlands NC guided fly fishing trips tend to be most popular in April through November. However, December through March can be excellent in our local waters. 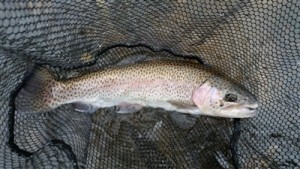 The best trout fishing waters near Highlands, NC usually involve about an hour drive. The delayed harvest section of the Tuckasegee River in Dillsboro has provided great fishing opportunities for nearby Cashiers, Asheville, and Highlands which are all about an hour drive. Our trout fishing guides meet you in the town of Dillsboro for either a float trip or a wade trip on the Tuckasegee River. For those visiting Highlands, the Cullasaja River flows out of the lake in Highlands and offers some great waterfalls for photos. The lake is too warm for great trout water hence it hurts the trout fishing downstream. The Chattooga River at the iron bridge outside of Highlands offers much better waters for experienced fly fishers. It is not forgiving with canopy, diverse currents, and large undercut rocks in this rugged section of the Chattooga. Other area attractions can be found by contacting the Bryson City, NC Chamber of Commerce. The number is 800-867-9246. Swain County is the trout mecca of the southern states. Nantahala National Forest and the Great Smoky Mountains National Park make up over 85% of Swain County. Perfect for creating the “TroutCapital” of the East! The Park visitors exceed 14 million people per year! The area is known for whitewater rafting, kayaking, Smoky Mountain Railroad, Appalachian Trail, waterfalls, mountain biking, and many other outdoor adventures! It is not hard to see why our little Smoky Mountain town of Bryson City is always expanding. Many great new restaurants and lodging in Bryson City for hosting large groups. Cherokee, NC is about a 10-minute drive from Bryson City. We are about an hour drive from Highlands and Asheville NC. Knoxville and Chattanooga TN is about 2 1/2 hours away. Atlanta, GA, and Charlotte, NC are about a 3-hour drive. Plan your next get-a-away to the trout mecca town of Bryson City, NC! My favorite addition to the town is the Nantahala Brewery which also provides some very good bands all through the season!